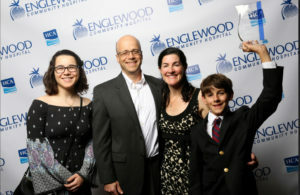 Dr. Lilly is honored to receive the Physician of the Year Award from Englewood Community Hospital. Dr. Lilly is a general surgeon who has specialized training and experience managing surgical problems with a minimally invasive approach. He attended medical school on an Air Force scholarship. During general surgery residency at Keesler USAF Medical Center he found himself in the midst of a laparoscopy revolution, and found that surgery done through the laparoscope came easily to him. He became the first surgeon in the US military to attend a fellowship in laparoscopy. On completion he spent the next 4 years training residents in general surgery, with of course a minimally invasive approach in mind. 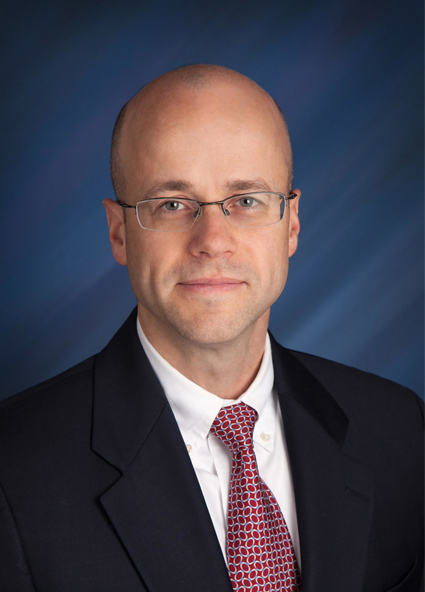 Dr. Lilly has published numerous surgical papers in peer reviewed journals, and frequently acts as a reviewer for Surgical Laparoscopy, Endoscopy and Percutaneous Techniques. He has presented as a faculty member at numerous national surgical meetings including teaching ultrasound to surgeons for the American College of Surgeons. 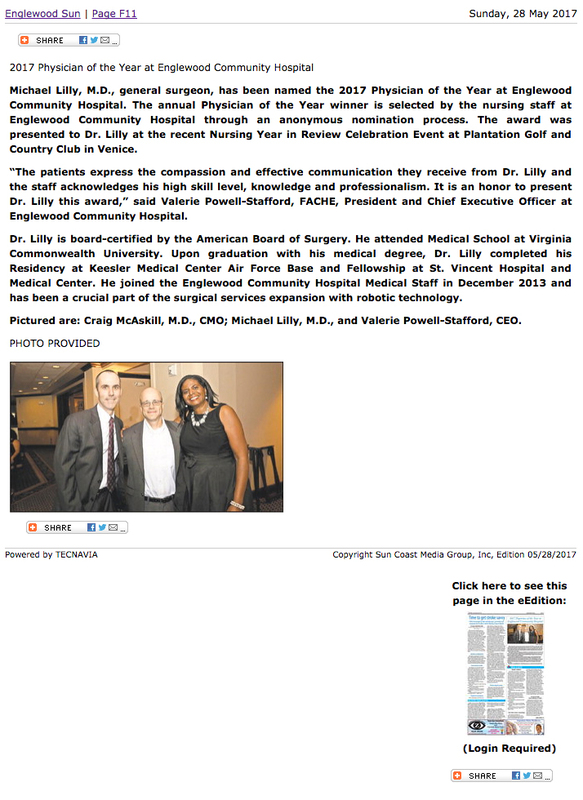 Prior to coming to Englewood, Dr. Lilly was in practice in Williamsburg, VA where he developed a busy practice while overseeing the development of Sentara hospitals cancer network as the American College of Surgeons, Network Cancer Liaison Physician. Dr Lilly has joined the gastroenterologists of Gulf Comprehensive Gastroenterology as a natural extension of their state of the art gastroenterological care, providing seamless support with the most up to date surgical care. 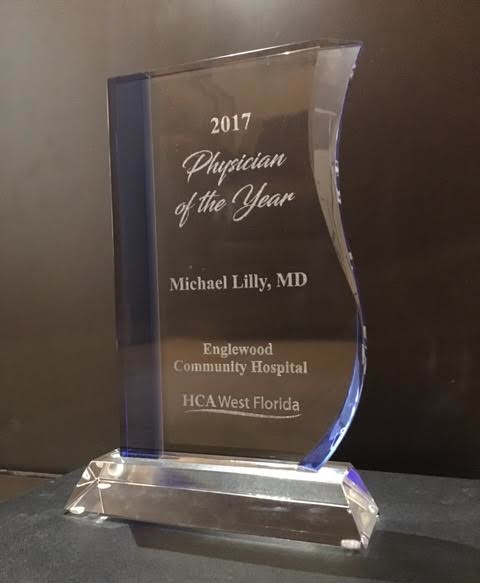 Dr. Lilly has an extensive experience with laparoscopic colorectal surgery, hiatal hernia surgery and the treatment of reflux. In addition to GI surgery Dr. Lilly has a large experience with endocrine surgery including thyroidectomy, minimally invasive parathyroidectomy and laparoscopic adrenalectomy. He also is an expert in hernia repair, having been trained by Dr Maurice Arregui, one of the pioneers of laparoscopic hernia repair, and in the past has been asked to speak at the American Hernia Society. Dr. Lilly lives in Venice with his wife, Erin and children who attend Venice Christian School.